This is the game we dream/worry about all year! And for this first time instead of taking on UGA the second week of the season, they have been pushed it back into the heart of our schedule. This game not only carries the weight of the SEC East crown, but could also end up having national championship implications. And the excitement surrounding this game has only increased with the arrival of ESPN’s College Gameday to the Horseshoe! The potential of this game is overwhelming, even to the average fan, but for those of us who live and breathe football it could quite literally go down as one of the greatest games we’ve ever seen! Georgia’s quarterback Aaron Murray leads a potent offense into Columbia that has had no trouble putting points on the board this season. With the tandem of freshman running backs in Todd Gurley and Keith Marshall, Georgia has been able to move the ball on the ground against some good defensive lines and this must continue against the Gamecocks to allow for Murray to use his arm when the time comes. Murray is a top tier quarterback in the SEC and when his offensive line gives him time he can pick apart defenses at all levels. The Bulldogs defense has struggled at times this season, allowing opposing offenses to put up large numbers but when the game has been on the line they have come up big. Last week they stood up against Tennessee late in the game to preserve the lead and seal the win. 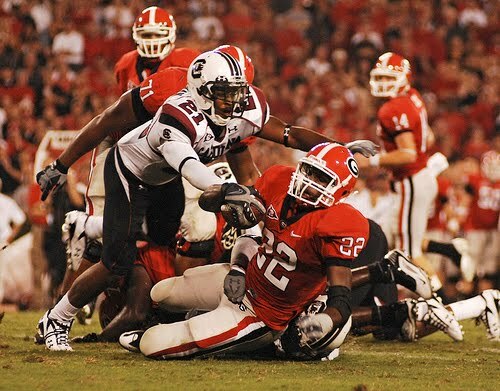 The defensive line must keep Marcus Lattimore in check if they have any hope of coming out the victors in this game. Marcus Lattimore. From the first time he stepped on the field against UGA, he has picked them apart play after play and has put the team on his back in these big games. Connor Shaw must take care of the ball and continue his stellar passing for the Gamecocks to win this week’s matchup. This game could very likely be decided by one play, and that is why it is going to be so important to take care of the football. Carolina’s defense has a big task in containing Georgia’s offense, but it may be a little easier now that they have lost their leading receiver to an ACL tear earlier this week. Jadeveon Clowney and Devin Taylor must contain Murray and force him to make bad throws. If he has too much time it will not end well for the Gamecocks. UGA: The defense must stop Lattimore and force the Gamecocks to throw the ball. USC: The Gamecocks must protect the ball and not make mistakes on special teams.